We celebrated a big birthday last week, our oldest turned 18! 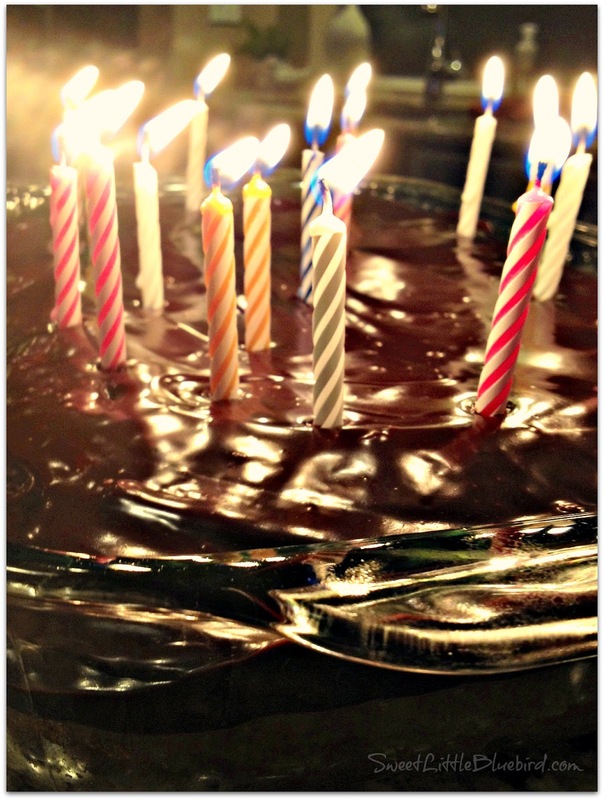 For her birthday she requested three things for her celebration dinner – her favorite Naan Pizza with fresh mozzarella, tomato and basil, my popular “Most Requested” salad and for dessert, Vanilla Crazy Cake with Chocolate Ganache. 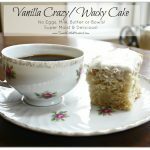 CRAZY CAKE, also known as Wacky Cake & Depression Cake – No Eggs, Milk, Butter, Bowls or Mixers! Super moist and delicious. Go-to recipe for egg/dairy allergies. Great activity to do with kids. Recipe dates back to the Great Depression. It’s darn good cake! 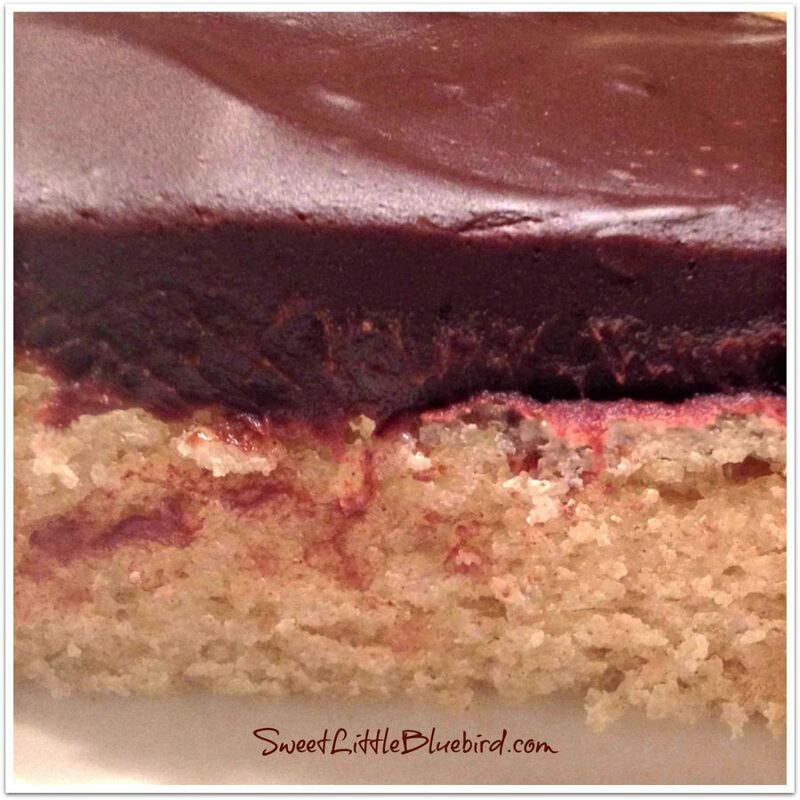 Here is my daughter’s Vanilla Crazy Cake topped with a rich, wonderful chocolate ganache. The ganache contains dairy, but I shared a link below for a dairy-free frosting option for those with allergies or on vegan diets. Our youngest has an egg allergy, so this is a cake the entire family can enjoy. 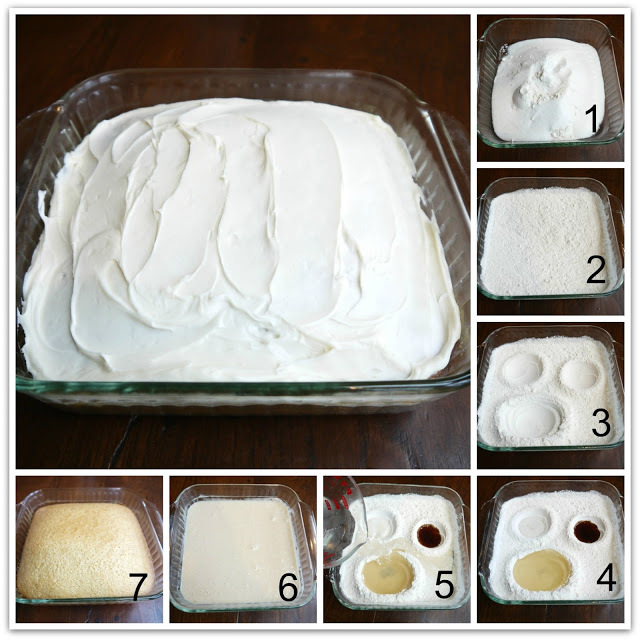 Mix first 4 dry ingredients in a greased 8″ square baking pan. Make 3 depressions in dry ingredients – two small, one larger (see #3 in photo below). Pour vinegar in one depression, vanilla in the other and the vegetable oil in third larger depression. Pour water over all. Mix well until smooth. Bake on middle rack of oven for 35 minutes. Check with toothpick to make sure it comes out clean. Cool. Top with your favorite frosting. Enjoy! Place heavy cream in medium size bowl and microwave on high for 1 minute or until it begins to bubble/boil. When it starts to boil, remove from microwave, add chocolate chips and allow to sit and start to melt (about 1 1/2 minutes). When ready, mix well until chocolate is silky smooth. If it’s not smooth, it may need another 20 to 30 seconds in the microwave – do not boil. Mix until silky smooth. Once ready, add vanilla mix well and allow to sit for a few minutes then mix again and pour over cake and spread evenly. Allow ganache to set a few hours before serving. For a great easy chocolate frosting (my favorite) head over to THE YUMMY LIFE, for a ONE MINUTE FROSTING recipe! 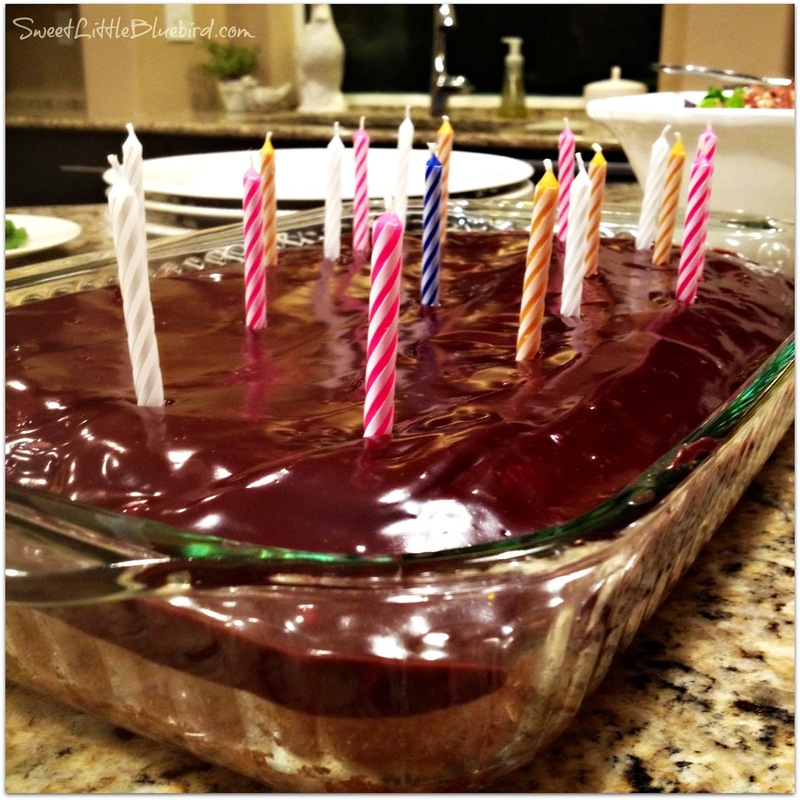 For a dairy free frosting recipe, head over to Oh She Glows for a simple 2-ingredient chocolate fudge frosting recipe! Great Chocolate Peanut Butter Frosting recipe from The Beating Hearth! You can also mix the batter in a bowl for neater, easier mixing. Be sure to follow the directions the same way – mixing the dry ingredients then making the depressions for the wet ingredients. Don’t forget to grease you pan. Has anyone made this as cupcakes?! I lost my written recipe book and then starting searching a Vegan Vanilla Cake recipe and fell over yours, wow it’s amazing. Then I tried the Vegan Chocolate cake and it’s double amazing. Next I’m going to try the Lemon one as I know I won’t be disappointed. I find it’s hard to find a good Vegan Lemon cake recipe. I forgot the sugar! And it still tast3d great. Will definitely try the other flavours. Thanks. Can this be converted to a banana cake? I want to make gluten/dairy free banana cake. Thanks for the help! Sweet recipe! I have it in the oven now 🙂 I tried it by licking the stir spoon and it`s mind boggling. It`s my first try with the vanilla wacky cake. I`ve made about 5-7 of the chocolate ones so I know a lot of the basics. Hi just wondering how to modify the recipe for 3 round pans stacked to make a smash cake for my daughters first birthday. Has anyone had success with that? Hi, Can these be made in to cupcakes? Is this cake sturdy enough to split & layer? I want to make a layered rainbow cake for my daughter's birthday and one of her guests has an egg allergy. So happy to see it works with gluten free flour! Off to try is gluten free and sugar free. Hopefully it works like that too! In my experience the vinegar should read 1 tablespoon not 1 teaspoon and the cake should then taste o k and rise normally. 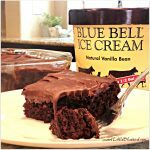 I've made the Wacky Chocolate Cake for as long as I can remember but I've never heard or seen any other "Wacky" flavors! YAY! I'm wondering tho, do you think bananas could be added to the vanilla for a banana cake? For Canada Day, I made this cake with strawberries – red and whit, right? I doubled the recipe, folded in nearly about two cups of sliced strawberries and baked it in a tube pan till it tested done. It got raves from my neighbours, especially the one with an egg allergy! Thanks so much – this is such a simple recipe with so many possible variations. I think the next ones I'll try is vanilla cake with chocolate chips, or maybe raspberry and lime. Thanks ever so much for sharing the recipe. My goddaughter has even requested it for her birthday. 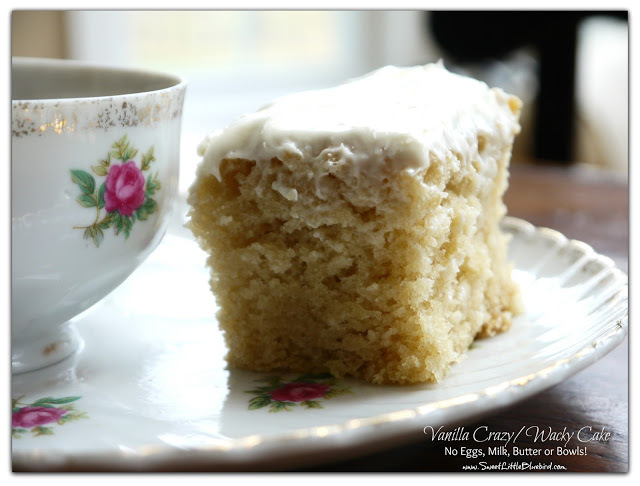 I tried the vanilla cake mix, seemed very easy as i had done with the chocolate cake. I used a conventional oven set at 180C seems to be good for all other cakes, i used high grade flour. The cake was flat, didn't rise or fluff up as expected, and didn't smell like vanilla? It was disappointing, wonder what went wrong. Tammy could you have done 2 smaller in diameter and then put them on top of each other? I've just put a double batch in a circular about 9" pan and after 35 mins its looking ok i know when I've done a different version of the chocolate cake and done several batches it took ages and didn't rise a huge amount but it was still great when it was cooked. this recipe does need more vinegar in it i think i remember having a problem with a soda taste fingers crossed for the one in the oven. So I tried your crazy wacky spice cake last week and it came out amazing. We're having my son's birthday party tomorrow, so I figured I'd try the vanilla one, with a double recipe for the party. Everyone commented that the cake was a little flatter than it could have been last week and I figured it was because I used a larger pan than you said, so I thought that using the larger pan for a double mixture would work. I used a circular pan which is about 11" diameter, I think, and the batter came to where I expected. But after 35 minutes it was still completely liquid. I ended up leaving it in the oven for about an hour and a quarter in the end, and even now, I suspect the very center is not quite cooked through and will be "fudgy". I'm so bummed out because I was planning to make it really fancy, and cut it in half, into two cakes, and add cream and jam in between and then add icing and the Spiderman picture we had printed on sugar paper specially. Yes, these cakes work wonderfully with gluten-free flours, and I've served them to gluten eaters and they vanished almost immediately. I've even been in the position of having had butter, but not oil, and again, the recipe worked. Chocolate chips are a nice addition to this, or the chocolate cake, as are toasted nuts. Orange or lemon extract in the vanilla cake, as well as some grated rind, are very nice, too – make a simple icing with butter, icing sugar and juice of the fruit rind you used to top it off. 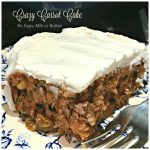 Has anyone tried fruit in these cake recipes? I want to try chopped strawberry in the vanilla one but not sure it would change the consistency. I added fresh plums and it was AWESOME! Rachel – my chocolate cake version of this has half the amount of baking soda and salt, but treble the vinegar, maybe play with your proportions? made this sevreal times as cupcakes and i always get this strong taste of soda, has it happend to anyone else? what should i do? Can this be made more Paleo? IE without gluten, refined sugar or inflammatory vegetable oil? Just wondering if it would work using gluten free flours, honey or maple syrup and probably coconut oil? Yes it works. I use almond flour or cassava flour with local honey. You might need a tad bit more flour though! I've been making a scrumptious cake similar to this for years. It's called Busy-Day Chocolate Cake from Lucinda Scala Quinn's "Mad Hungry". I've always wondered about other cake variations, so I was super excited to find your recipe on Pinterest. I quickly got to mixing, but when it came to adding the vanilla, I noticed I didn't have enough. So, I used almond extract and made a delicious almond cake. WOW! It's soooooooo good! Thanks so much for the awesome recipe! 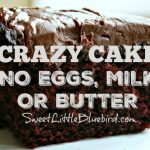 I can't wait to try all of your other crazy cakes!! Look at you! Making something already yummy even more awesome! Yumm!